Aliens are evil and we need tough Space Marines to keep them from exterminating all humans. We need heroes like Edward Buck. Buck is one tough dude and he has the skills and the smarts to take down any alien who tries to hurt his friends! If your teen plays the Halo games, then it’s pretty likely that he’s spent some time pretending that he’s the hero from the game. Why not help his imagination out with this muscle chest costume based on the character from the game? 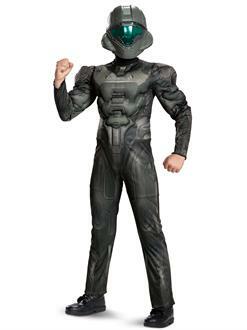 This Spartan Buck Classic Muscle Teen Costume is a great way for your teen to step into the role of a Space Marine. It comes with a jumpsuit that has padding in the chest, arms, and legs to give your teen a muscular look. It also has printed details made to recreate the look from the video game. Finally, the costume includes a mask, which looks like a helmet tough enough to take a few hits from a Needler. However, the helmet is not intended for protection. This is an officially licensed HALO product. Care Instruction: Hand wash cold. Do not bleach. Line dry. Cool iron if needed. Do not dry clean.